International Nestlé-Free Week is a time for people who boycott Nestlé over the way it pushes baby milk to do more to promote the boycott – and for those who don’t boycott to give it a go. Boycott supporters are also encouraged to contact Nestlé to let it know they are boycotting. 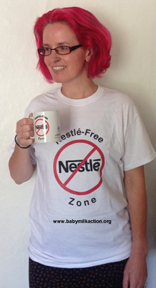 During Nestlé-Free Week 2015 (26 October – 1 November) Baby Milk Action asked supporters to call on Nestlé to stop promoting its breastmilk substitutes with the claim they “protect” babies and are the “gentle start”. Babies fed on formula are more likely to become sick than breastfed babies and, in conditions of poverty, more likely to die (as confirmed by the World Health Organisation (WHO) organised systematic review of research published in Acta Paediatrica, December 2015). Past campaigns have proved successful, with Nestlé promising last year to stop promoting its formula with the claim it is the “natural start”. In a standard response in Nestlé-Free Week 2015 forwarded to Baby Milk Action, Nestlé dismisses the suggestion that it needs to change its marketing practices. However, there is an important shift in its stated support for breastfeeding. Bangladesh is one of the countries where Nestlé promotes its formula as the “gentle start” for babies, telling investors this is a “growth engine” for sales. Nestlé calls it “project happy”. 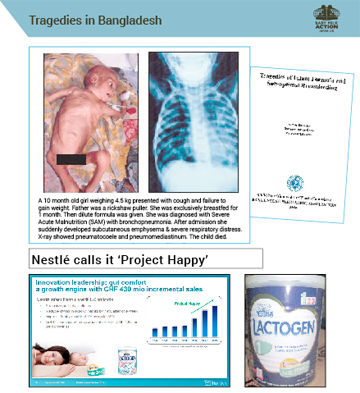 In 2014, the Bangladesh Paediatric Association published a booklet of case studies called Tragedies of Infant Formula and Sub-Optimal Breastfeeding – an example is included in Baby Milk Action’s members’ newsletter (left). “Nestlé was recently voted the ‘least ethical company‘ of the past 25 years and its latest response on its baby milk marketing is typical. Instead of agreeing to bring practices into line with the marketing standards adopted by the World Health Assembly it claims it is doing nothing wrong. I hope people agree that it is unacceptable for Nestlé to promote formula with the claim it ‘protects’ babies when too many become sick or die through not having the protection provided by breastfeeding, just one of its aggressive marketing practices. Nestlé also refuses to bring instructions on how to prepare formula into line with WHO guidance to reduce risks for mothers who use it. “These practices come from the very top of the company. They are defended by Nestlé Chairman Peter Brabeck-Letmathé and CEO Paul Bulcke when we raise them in writing and at the shareholder meeting. As executives put company profits first, the boycott gives them a financial reason to change and forces some changes. Nestlé’s reluctance to acknowledge the importance of breastfeeding beyond six months is because its own policies allow advertising of breastmilk substitutes during the period of continued breastfeeding. Nestlé weakened its policies in 2010 even further to allow advertising for formulas for older babies to cross-promote infant formula brands, something it had previously promised not to do. This step backwards came about as Nestlé was applying for inclusion in the FTSE4Good ethical investment index, which assesses companies against their own policies, rather than World Health Assembly marketing requirements. Nestlé was admitted to FTSE4Good despite weakening it policies and continuing to systematically violate the World Health Assembly requirements. 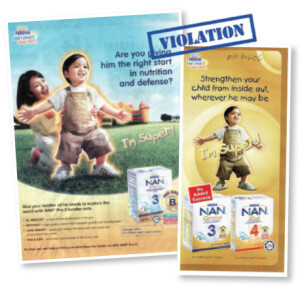 Below, Nestlé promotes the Nan infant formula brand in Malaysia with the slogan “Are you giving him the right start in nutrition and defence?” Nestlé’s flawed policies allow this advertising as the pack shots shown are for older babies, the 3rd and 4th formulas in the range. Just one example in Breaking the Rules, Stretching the Rules 2014 from the International Baby Food Action Network (IBFAN).